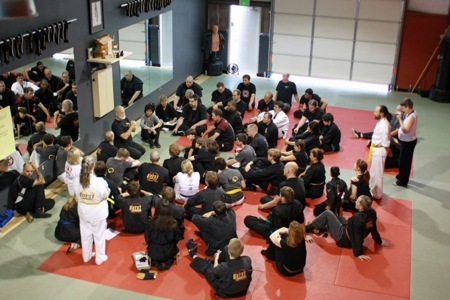 Several times throughout the year I like to travel to other To-Shin-Do training halls and explore how they operate. Generally, I choose a time when a major seminar with my teacher, Mark Sentoshi Russo, or his teacher, An-Shu Stephen K. Hayes is held. In August I ventured out west to Boulder, Colorado, to visit Kevin and Mary Casey as they hosted An-Shu Hayes for a weekend of Mind Science and Physical training. I have a great appreciation for working with practitioners I don’t see often because there’s no ‘comfort level’ or ‘familiarity’ with the way I move, and vice versa. The attack’s I give and receive have an unknown quality to them and from my experience that increases the quality of training. At my home dojo in Tampa, FL, attention must be heightened as to not ‘expect’ how your training partner will respond because you have an understanding of their skill level. While the physical training was great, as equally interesting is the continuation of this year’s theme, Nine Cuts-Nine Powers a reference to the ninja’s legendary kuji-kiri. We explored the 7th aspect of these human potentials to discover what significant experiences we may be over-looking in our daily lives, cultivating internal wisdom (or what some may refer to as clairvoyance). A very profound weekend.